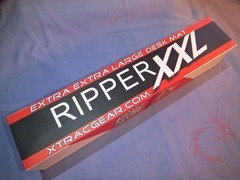 The Ripper XXL is one of the biggest mouse mats in the world. Measuring 36″ wide x 18″ high (914mm x 457mm) this is not your ordinary mouse pad. Imagine putting shock absorbers underneath your keyboard/mouse and you will have an idea of the level of comfort you can get from the Ripper XXL. That is right, this mouse pad is so big that many people can cover their entire PC working area. Simply unroll the Ripper XXL, lift up your keyboard and/or monitor, and place the Ripper XXL underneath leaving some pad to use your mouse on. When your friends see it they might say “Its so BIG!”. -Whisper quiet mouse surface helps enhance an ergonomic workspace. -Ripper XXL is so big that you can place your keyboard on top of it. The polished textile can assist in helping to reducing keyboard typing sounds as well as helping make your work environment more ergonomic. -Using a new polished textile for the mouse surface the XTracGear Ripper XXL can help speed up your mouse movement while feeling soft and silky at the same time. -Open celled rubber backing helps to cushion the wrist while at your computer for long periods of time. 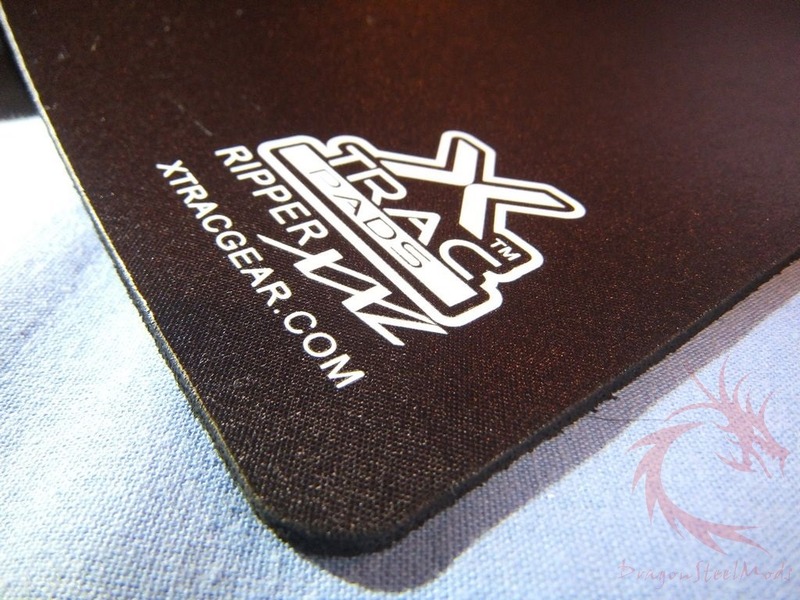 -The desktop size of the XTracGear Ripper XXL gamer mouse pad is excellent for users who prefer low sensitivity settings on their computer mice. 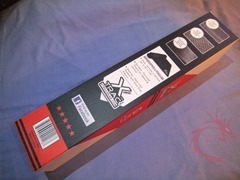 The Ripper XXL comes in a sturdy box with information about the pad on the back and sides. The box is sturdy enough to use as a carrier if you wanted to so you could take it with you. The Ripper XXL comes rolled up as you might expect as it’s a bit big to ship while open. The dimensions are 36″ x 18″ x 1/8″ or about 914mm x 457 mm. 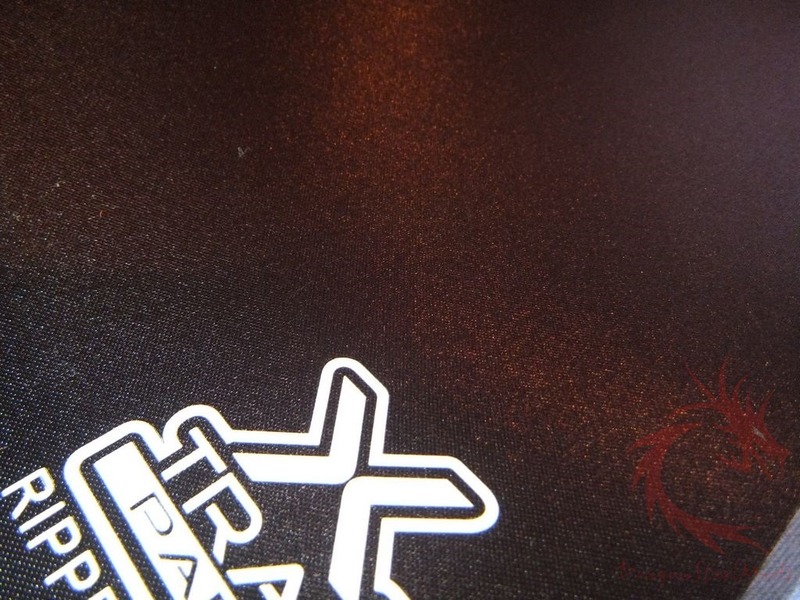 The pad is all black except for the XTrac logo. Here’s the logo which has the XTrac web address there for you along with the name Ripper XXL. 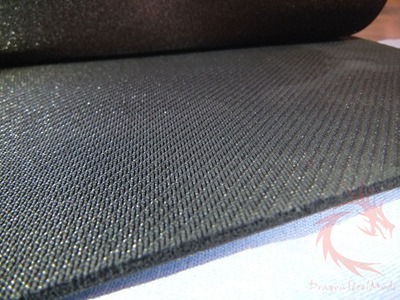 The mousepad is 1/8” thick and it looks like a foam pad really. The foam is firm though and has a slight give to it, soft enough to be comfortable, but yet firm enough to create a flat and even mousing surface. The entire back is covered with a what looks like a diamond pattern or open cell and it’s all rubber to keep the pad from moving while on your desk. The open cells of the pattern allow the pad to sort of suction itself to the surface, and it does work very well. 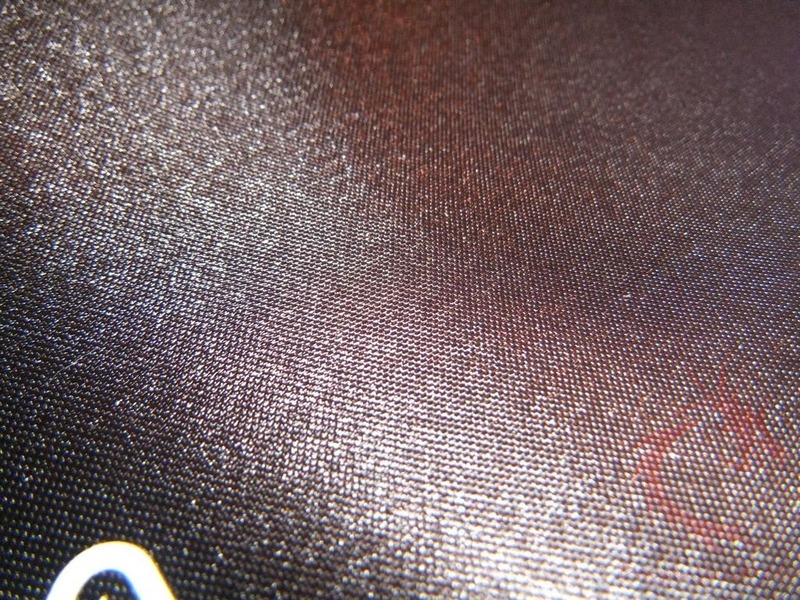 The surface of the Ripper XXL is black obviously and it’s a cloth material or what XTrac calls a Polished Textile Surface. If you get the angle and light right, the surface almost has a reflective quality to it. 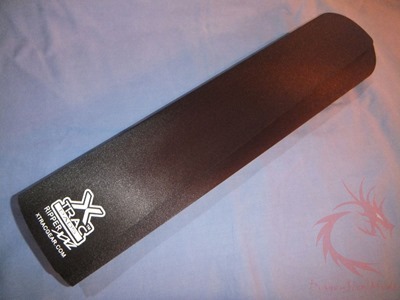 The surface of the Ripper XXXL gives the user a smooth and slick mousing surface but yet you still have control. It’s very much unlike other cloth pads on the market today. Thankfully I’ve got a big desk as that’s what you must have to use the Ripper XXL. 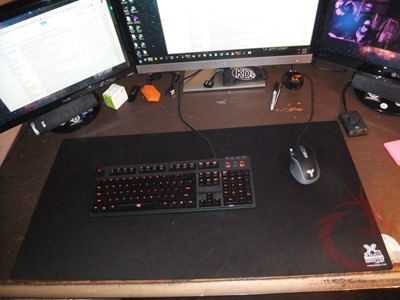 Sadly my desk is old and in bad need of refinishing the surface, but the Ripper XXL works great for me to not only cover the desk but give me a comfortable surface to rest my arms on. The Ripper XXL is large enough to put your mouse and keyboard on it and still have room for whatever else like a monitor maybe. I have nothing but good things to say about the XTracGear Ripper XXL mousing surface, I had the version before and used it everyday for years and I can see myself doing the same thing with this version. 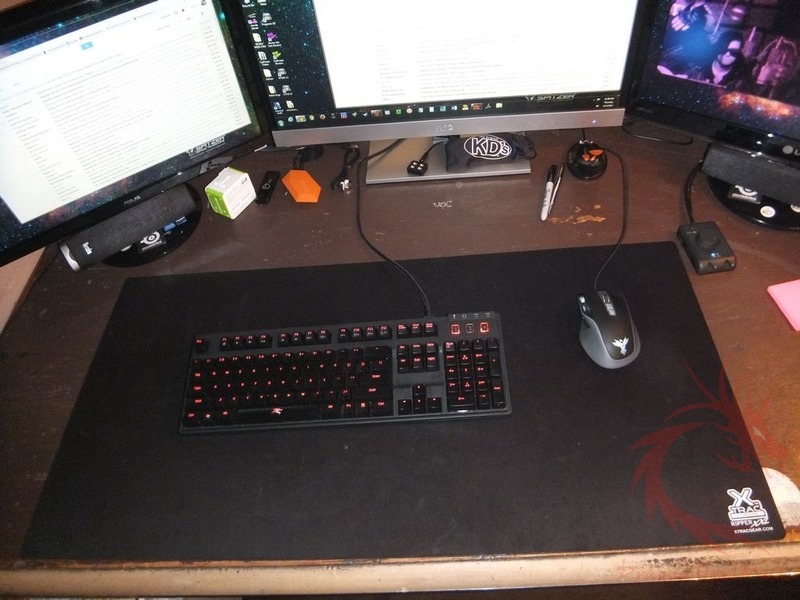 One of the downsides with the pad could be the size, it’s huge, but I’m sure you know the size of your desk so you’d know if the Ripper XXL would fit or not. 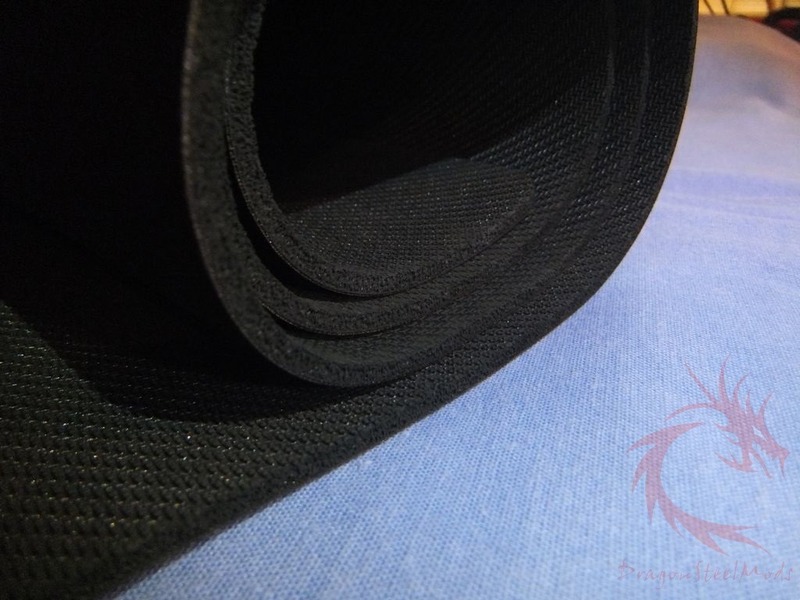 Using a mouse on the Ripper XXL is an effortless experience, the surface let’s your mouse just glide across it easily but the cloth gives you more than enough control. DragonSteelMods gives the XTracGear Ripper XXL a 5 out of 5 score.